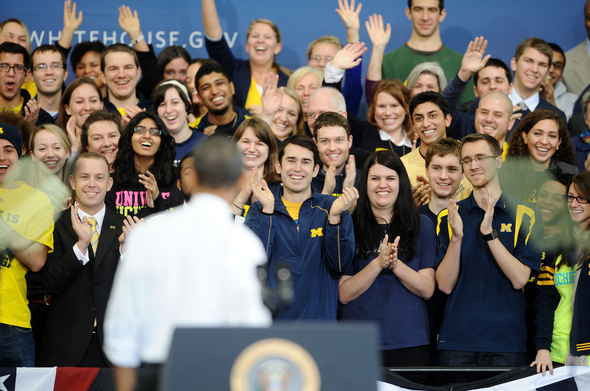 Posted on Sun, Jan 29, 2012 : 9:08 a.m.
President Obama greets University of Michigan students and supporters before he takes to the podium at the Al Glick Fieldhouse on Friday morning. Regardless of one's politics, it is always good to have a smart POTUS (President of the United States) visiting your state. Sure there are the inevitable traffic jams, police overtime costs and logistical headaches. But there is nothing better than commanding our president’s attention, as well as that of the nation and the world, on your hometown. To have his focus on education is icing on the cake. Education and talent will rule as the 21st century unfolds. It should be our goal to make Michigan and America the brain bank of the world, where everyone comes for deposits and withdrawals. The city, state, and nation that gets right its system of learning to prepare its citizens to be competitive on the world stage will soar while others sour. Speaking at the University of Michigan Friday, President Obama forcefully reinforced his message about college affordability saying, "When kids do graduate, the most daunting challenge can be the cost of college. At a time when Americans owe more in tuition than credit card debt, this Congress needs to stop the interest rates on student loans from doubling in July. Extend the college tuition tax credit we started, that saves middle-class families thousands of dollars. And, give more young people the chance to earn their way through college by doubling the number of work-study jobs in the next five years." At the other end of the spectrum, the president also spotlighted our nations high school dropout rate -- a national disgrace. Michigan is well ahead of the curve when it comes to addressing the high school dropout crisis, which when analyzed on a national level, might well be considered a public health care epidemic. To have a law on the books that allows a child to leave school at the tender age of 16, without an education is state sponsored stupidity. As the incoming state superintendent in 2001, I called for this change in Michigan and the law was later changed. A recent study by Citizens Research Council (crcmich.org) highlights the importance of teachers and how Michigan could do a better, more efficient job of preparing its classroom leaders. We need to engage classroom teachers and listen to their voice as we embrace and lead school change. The president also said, “At a time when other countries are doubling down on education, tight budgets have forced states to layoff thousands of teachers. We know a good teacher can increase the lifetime income of a classroom by over $250,000. A great teacher can offer an escape from poverty to a child who dreams beyond his circumstances. Our country’s future will only be brighter if we heed these ideas now -- we owe it to our collective futures to invest in the human potential of all Americans. 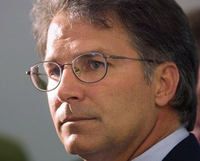 Tom Watkins served as Michigan's state superintendent of schools, 2001-05. He can be reached at tdwatkins88@gmail.com. Mon, Jan 30, 2012 : 9:13 p.m. Affordability starts with cutting pay, benefits, administration, and empire building at our educational institutions. It has become out of reach of everyone except for the children of college professors or elite student-athletes. Mon, Jan 30, 2012 : 4:50 a.m.
With four children to put through college, we sacrificed new cars, vacations, fancy clothes, cable TV, did all our own repairs, bought used cars, used clothing, and ate out very infrequently. That's how college is afforded. Mon, Jan 30, 2012 : 5:38 p.m. I'd bet those merit based scholarships were tax deductible to those providing them, don't you think ? Thanks to the Federal Government, and no disrespect but only kudos' to your kids for doing the right thing in studying hard in earning them as well. Just pointing out that the Federal Government is involved in supporting higher ed in almost all cases, even with people say they aren't. Mon, Jan 30, 2012 : 3:27 p.m.
@sparty- Non-government funded scholarships, merit-based. Good kids who studied hard in high school. Mon, Jan 30, 2012 : 1:21 p.m.
No loans, scholarships, financial aid of ANY type for any of those four students ? Sun, Jan 29, 2012 : 8:58 p.m. Yes, President Obama is right about education. Too bad he couldn't offer that message at Eastern or Washtenaw instead of one of the most elitist universities in America. UM raises its tuition while sitting on a $15 billion endowment. Then it's allowed to gobble up all the real estate it can while paying no property taxes, leaving the burden on Ann Arbor taxpayers. Sooner or later Ann Arbor will have to institute a city income tax to offset the gluttonous appetite of the hog that UM has become. Mon, Jan 30, 2012 : 3:44 a.m. Yes, that hog that employs more people than the next 24 largest employers in the county combined? Do you think they contribute to Ann Arbor businesses, which pay taxes? Maybe rent or own homes here, therefore paying property taxes, etc.? That brings in 40,000+ students each year who have to live, eat, and entertain themselves locally - perhaps contributing to Ann Arbor? Or perhaps those athletics events that bring in hundreds of thousands f people each year - do you think they contribute to Ann Arbors businesses? Uninformed responses like yours are scary as they demonstrate a lack of insight to the value the UM brings to AA. Sun, Jan 29, 2012 : 9:04 p.m.
Sun, Jan 29, 2012 : 8:35 p.m. The question is how do you make college affordable? Work study jobs won't put much of a dent in six figure college cost. The cost of college is largely related to payroll. Unfortunately, that makes cuts painful and personal. The most envied position in university life is research and writing, which means that the faculty member isn't teaching. If the research isn't fully underwritten that pushes up tuition. The other painful area is class size. The more people in a class room, the lower the cost per student. But students, teacher, and employers want small class size and individual attention. So more corporate money for research might help a bit, but that money only tends to come when there is a clear marketable outcome. Hard choices for anybody. However, how is it that public universities have GROWING multi-million (billion) dollar endowments and continue to receive government funds? That it would seem would make a difference as well. Sun, Jan 29, 2012 : 9:05 p.m.
you goto junior college for two years..
Sun, Jan 29, 2012 : 7:31 p.m.
braggslaw said ,&quot;If all you have is name calling you have lost the argument . &quot; So should I not say right wing loonies,goof ball republicans or uneducated nut cases? Help me out here. Mon, Jan 30, 2012 : 3:34 a.m.
Sun, Jan 29, 2012 : 6:20 p.m.
Did he mention that unionization of the graduate assistants will run up tuition even more? Didn't think so. Sun, Jan 29, 2012 : 5:30 p.m. While I sometimes swing from one side to another on these issues I have to agree with Tom, for the most part. And, heaven forbid, the POTUS in the remarks that Tom quotes. However, the viciousness of samne of the comments underlines the problem of not just discord but the gulf that separates the people from the powerful unions. Sadly, their policy of smear anything or anyone who disagrees with them continues the cancer of poor education in the hands of self-interest quacks that could not perform surgery on a rock. Sun, Jan 29, 2012 : 4:46 p.m. If we put aside the anti-President Obama loonies, who seem to comment off-topic with venom whenever a story mentions his name, this is is a serious issue, although I am not sure that it has been framed correctly. College costs are high, but little of that is due to factors that can easily be controlled. Salaries for faculty are not as high as most imagine--the averages that are published are misleading because they include the professional schools. In those the salaries far outstrip what is normal in the core of the university, because all salaries are driven by national competition and doctors and lawyers simply make more money than historians (except one failed one who was denied tenure ...). It is true that some administrators are now grossly overpaid, but that is a small matter in the overall budget. The real costs at places like UM are fuel and maintenance, health insurance and other issues that are difficult for any organization to control. But the real issue is not college--it is primary education. We have to find a way to drastically improve high school education, which has slipped terribly. Students who lack basic knowledge cannot learn much in college, no matter how good it may be. If a four year college has to spend much time bringing students up to levels that they should have achieved years earlier, then the education is wasted. We also do not pay enough attention to learning languages--that has to be started at an early age, as is the case in most modern countries where students learn English and other languages early, when it is easier for humans to acquire languages. This is not a &quot;political&quot; issue--it is a matter of national survival. If we do not make radical changes in basic education, the country will not be able to compete in the modern era. Mon, Jan 30, 2012 : 1:19 p.m.
Name a business that held the line on costs. ROFL. Sun, Jan 29, 2012 : 9:03 p.m.
A service based industry whose costs rise as a multiple of inflation (not tied to raw material costs) = mismanagement. Most businesses held the line on costs, universities did not. Sun, Jan 29, 2012 : 7:26 p.m. Such as? You gain success when you focus resources on it. Sun, Jan 29, 2012 : 5:03 p.m.
Sun, Jan 29, 2012 : 4:39 p.m. The President's proposals were more of the same top down federal approach he takes with every problem. He intends on throwing more borrowed money at the problem in the form of tax credits, and grants. I have not heard of one proposal to limit salaries and benefits for public university employees or cut programs that benefit a small number of students. He did talk about keeping children in high school until age 18 or graduation. Wow that was a bold proposal. Let us get the feds out of the business of education and put it back into the control of each state. Let Michigan devise a program that is financed and designed for the residence of Michigan. The current system takes money from Michigan taxpayers and puts it into the federal beuacracy and gives us back a small portion with strings attached. Mon, Jan 30, 2012 : 1:16 p.m.
Perhaps not enough focus, resources, or investment on a national level ? Mon, Jan 30, 2012 : 12:47 a.m.
Countries like Japan beat us in education because they work harder than we do. Not because they have a centralized education system. If the Dept of Ed. is so critical and effective why is the U.S. lagging behind other developed countries. The graduation rate in Detroit is a national disgrace. Where is the Dept of Ed in addressing that problem? Sun, Jan 29, 2012 : 7:25 p.m.
And how would 50+ different approaches to education be beneficial in the USA? Where is the sharing of best practices? Where are minimum standards kept and the key national focus of successful countries like Japan, and other countries around the world that beat us in k-12 education to be addressed? Our US Department of Education is critical and must be maintained a key national focus to build a competitive advantage in our youth and then our businesses moving forward. Sun, Jan 29, 2012 : 4:18 p.m.
AnnArbor.com's comment section has become a party ground for right wing radicals. Sun, Jan 29, 2012 : 4:43 p.m.
Sun, Jan 29, 2012 : 4:03 p.m.
Sun, Jan 29, 2012 : 3:24 p.m.
POTUS has been the governments abbreviatiation for the President of the United States for decades, just as SCOTUS has been the abbreviation for the Supreme Court of the United States for decades. To somehow attribute the use of these decade old terms as if new to the current administration shows a clear lack of knowledge about our Government. Perhaps a better formed thought before posting Obama hating comments would better display intellect. Sun, Jan 29, 2012 : 4:53 p.m.
Well said Sparty.! The scary part is these uninformed posters are are allowed to vote. Sun, Jan 29, 2012 : 2:56 p.m. Nothing good comes from Obama, no matter how many bad abbreviations you put with it, seriously, POTUS? Sun, Jan 29, 2012 : 2:43 p.m.
A college education? Yes, it is important for some. But I know people with PhDs that drive taxies. Education needs to be relevant to the job market. What we have done is decided at the K-12 level that ALL students should be directed to college. Then we wonder why we have issues with drop out rates, poor grades and other problems. Not everyone needs college, everyone needs the skills to work in the current world. We are short of welders, machinists and other trades. We have forgotten that it was those skills that make it possible to build the tools that made the goods. Germany, one of the most robust economies in the world, has a system that should be reviewed as a model for the US. Like it or not, not everyone is going to go to college, and rather than waste their time in college prep classes that they will never use, offering them classes that lead to skilled jobs after high school should be a key part of high school training. Education should lead all people to a productive future with job opportunities. Sun, Jan 29, 2012 : 7:19 p.m. Imagine, letting adults over age 18 pursue the educational interests and career paths that they wish to. In the USA. It's a travesty. Sun, Jan 29, 2012 : 3:29 p.m.
No doubt DonBee there are many philsophy and Elizabethan poetry graduations with 100K in student loans and no ability to pay them back. Kids these days want to do what makes them happy and not what needs to be done. Sun, Jan 29, 2012 : 2:42 p.m.
&quot;POTUS&quot; ? That is one awful sounding acronym. It sounds like an experimental plant concocted in a laboratory. I just can't think of James Madison or Dwight Eisenhower as a &quot;POTUS&quot;. Sun, Jan 29, 2012 : 2:55 p.m.
Sun, Jan 29, 2012 : 2:41 p.m.
Mon, Jan 30, 2012 : 3:35 a.m. Yes, what would a former State Superintendent of Schools know about this topic when there are all of these armchair experts with opinions on every topic who must know better ? Sun, Jan 29, 2012 : 6:24 p.m.
@cgerben Because unions don't care about students or their achievement. They care about teachers and their benefits/salaries. If unions included what was in the best interest of the students, then I would have stayed in my teacher's union. I am Proud to a teacher who is NOT a member of my teacher union, I negotiate my own contract based on my qualities as a teacher who is doing what is best for her students. I don't want to be &quot;protected&quot; by a group who focuses on teaching for the retirement and not the students. Sun, Jan 29, 2012 : 3:26 p.m.
Common sense. Unions reduce accountability, flexibility,efficiency etc. etc. etc. Sun, Jan 29, 2012 : 3:16 p.m.
Care to elaborate (with evidence, please) exactly how unions &quot;hold hostage&quot; K-12 and how they only look out for themselves? Sun, Jan 29, 2012 : 2:30 p.m.
Of course everyone needs education, the problem is how we do it effficiently. College &quot;Brand&quot; is important, students see the brand of their college as a ticket to success or at least an indicator on their skill level or knowledge. The issue concerns public universities and how they should be managed, (although private schools do indirectly receive public funds). The two gargantuan universities in the State (UM and MSU) continue to raise tuition, build glorious institutional cathedrals etc. BUT they have not faced a decline in enrollment (in fact applications to both universities are at all time highs, as well as test scores and grades) There are no incentives for UM and MSU to reduce tuition as demand has not decreased but has in fact gone up. Compare that with schools like Wayne State and EMU which are struggling to fill their desks with qualified students. They are large institutions with relatively small endowment that count on tuition and state aid for cash flow. EMU recently made a tuition guarantee that slightlly bumped up applications, but you can only play that card once. Wayne State and EMU have a dismal graduation rate between 30-40%, which means that 1. They are not doing their job in retaining kids or 2. The students should never have gotten in in the first place. The issue is relatively simple to me, costs are going up because employee costs are going up (based on a failure of the administrations to fight for fiscal sanity). Health care, pension, guaranteed salary bumpts etc. School like UM and MSU can continue to raise tuition without any penalty and schools like Wayne State and EMU allow unqualified students entrance so that they can collect a pell grant check or a federally subsidized loan payment just to keep cash flow coming. There are always two year institutions that are an enormous bargain but they do not have the Brand that people desire.